Skwerl: Intonation. Showing interest and getting angry. 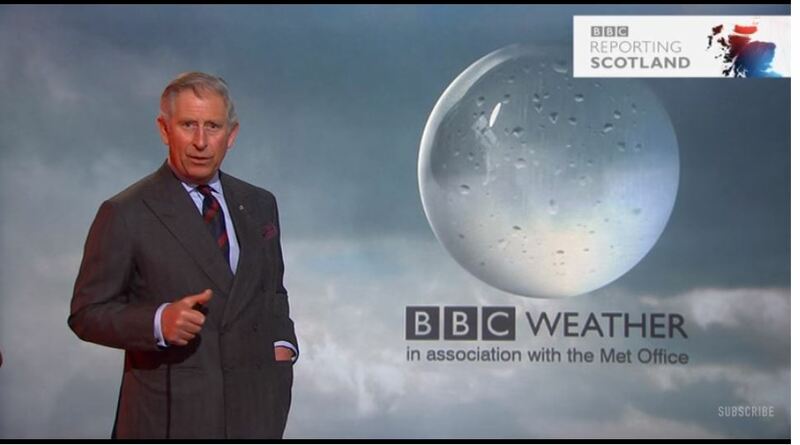 Is Prince Charles a weatherman? Unit 16 of this course is about weather and it is divided into 3 different activities that give a good explanation on this topic. The first activity is just to recognise some of the most usual symbols of the weather forecast but in the second activity, which is definitely over upper-intermediate, you will learn some engaging vocabulary related to weather forecast. You will also learn the difference between "downpours" and "showers" and when you will need to wear waterproofs (wellies) or carry a brolly or maybe forget about them because temperatures may get up to the mid or high teens (13-19 degrees). Watch the three sketches from the BBC programme and try to determine if the situations are true or a lie. Then watch them again and answer the questions you can find at the multimedia section. 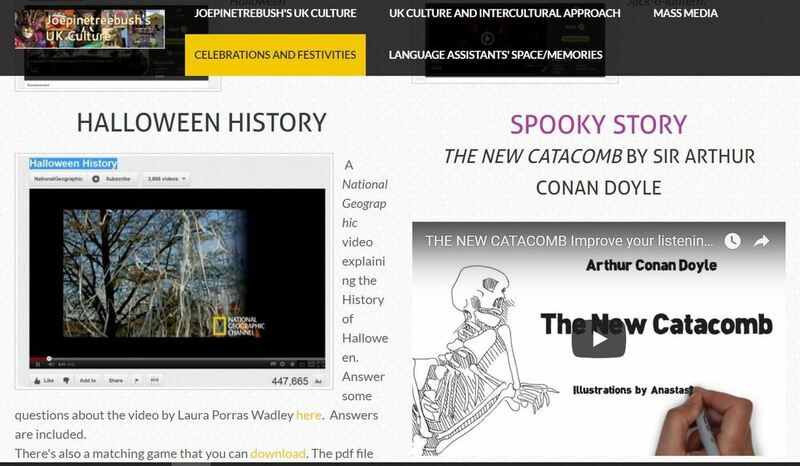 Watch a video on facebook with subritles: ​https://www.facebook.com/ajplusenglish/videos/1071983299609843/ or learn about the history of Halloween with a video from Channel History and two hand-outs, one by Laura Porras and another by Joe Pinetreebush on﻿ ﻿​﻿﻿﻿﻿http://joepinetreebush-ukculture.weebly.com/celebrations-and-festivities.html﻿﻿﻿﻿﻿﻿ Enjoy a story with nice illustrations and a helpful glossary by Sir Arthur Conan Doyle: The New catacomb as well. 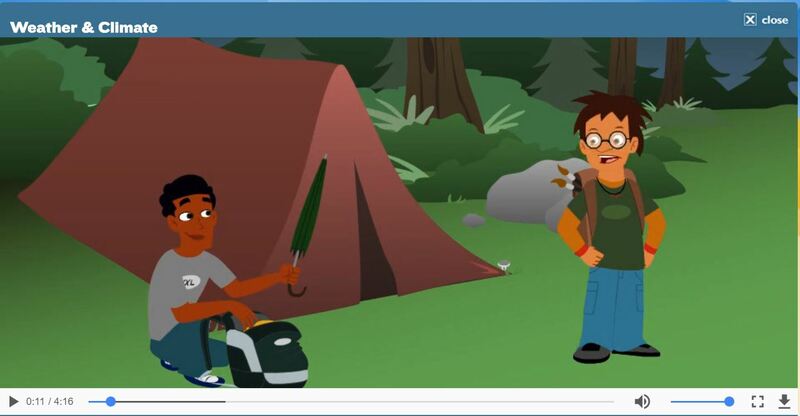 Find some activities about these two videos on downloads. ​Taken from All at C by Steve Muir. You are expected to give a 3-minute presentation about some of the topics we are learning in front of the class. Use the vocabulary section of your textbook to help you, apart from your class notes and explain any anecdote worth mentioning. -Describe a job interview you, a relative, a friend or a person you know well had. Explain what happened, how it went and if they got the job in the end. -Describe what the way you, a relative, a friend or a person you know well normally dress/ed, where they buy/bought their clothes, etc. Find a list with the dates you have to give your presentation and a guide on how to make a presentation, to give it afterwards, on downloads/speaking. You were assigned a compulsory date. If for any reason, you need to change it, you can do it with a classmate and tell me to do the necessary changes on the list afterwards. This activity must be finished at the end of November. Those people who did not do the presentation the day they were assigned and/or did not make the necessary changes previously will not have any other chance to give the presentation. I will send my comments about your presentations via email, so make sure I have your email address . You are expected to give a 3-minute presentation in front of the class, about some of the topics we are learning or we will learn in due course. Use the vocabulary section of your textbook to help you, any information taken and summarised (not copied) from the internet, or even your class notes. Explain any anecdote worth mentioning to the rest of the class. You are also advised to use or anticipate as many grammatical structures we have been studying or will study as possible. - Music and emotion or The soundtrack of my life: Get the instructions on downloads/speaking. You are invited to listen to your partners attentively and ask questions afterwards. Find a list with the dates you have to give your presentation a guide on how to make a presentation and a list of speech transitions taken from six minutes (speech and presentations) on downloads/speaking. Only people attending classes have been included. If you have any intention to give the presentation and you are not in the list, please contact me via email: joepinetreebush@hotmail.com. This activity will begin at he beginning of March and must be finished at the end of March. Those people who did not give the presentation the day they were assigned and/or did not make the necessary changes previously will not have any other chance to give the presentation. 0- Get your articles/excerpts long before giving your presentation. Deadline 9th March. The list will be published 10th-12th March. 1-4 minutes is the maximum time you can be speaking to your audience. The presentation will be stopped at that point regardless of what part of your presentation you are in. 2- Reading is forbidden. You can have some notes but written full sentences are not allowed. 3- You can use the whiteboard to write or draw, or even real or printed material (images, nothing to read or be read) to show to your partners. The use of Powerpoint Presentations is not allowed. 4- As the language used by Focus BBC can be formal or technical summarise and simplify when possible what you are going to talk about and be ready to answer questions from your partner. 5- You will be obviously assessed and a grade will be given. It will evaluate, pronunciation, intonation. fluency, use of vocabulary, ability to summarise, use of connectors, etc. 6- If you cannot attend the date you are assigned, you can always change it with a partner. Inform me about the change. If you do not finally attend the date you were given, you will miss the opportunity. For organisational reasons no other date will be given. 1- Make sure that the vocabulary you are going to use will be understood. You can only use Spanish in highly specialised cases. Use wordreference.com, linguee.es or any other online dictionary to help you with the meaning and translation of the words or expressions. Find a huge number of online dictionaries on my learning resources site. Here you will find four podcasts with their transcripts to choose just one to explain to your partners in April/ May. You will make groups of four to explain not only what the podcasts are about but also what new expressions and vocabulary you learnt from them. You can also find the files on 4th yearDownloads. This terrorist attack happened on Westminster Bridge. Click on the picture to know more about the location of the bridge and its significance in British life and culture. You will find more information on the terror attack on BBC News: a plan of the crime scene and a Daily Mail journalist, Quentin Letts, commenting on what he saw from his office (You can alternatively get this track on downloads). Please, read a text from ESOL COURSES and you can also watch two videos about this historical event below. Find a file with some questions on the Gunpowder Plot videos, the transcript and a Spanish/English glossary on both the text and the videos on Downloads. Very PC owner, Peter Hopton, pitches in Dragons´Den. Article from Daily Mirror explaining what happened afterwards. LINKS: Tip! To be able to watch the episodes with subtitles go to these links from fmovies or movieline, choose the server openload, click on CC and upload the right subtitle from your computer. Unfortunately this option does not include subtitles. This is the original sketch. The end is different. Tongue twisters are very useful to pronounce different sounds. These two scenes from the film "Singing in the rain" serve as an example of their difficulty. "Singing in the rain"- Diction coach. The answer is 15, but did you notice the gorilla? Half of the people who did this test didn't see the gorilla. This is called sustained inattentional blindness. Does it have to do with the distinction hunters-gatherers? 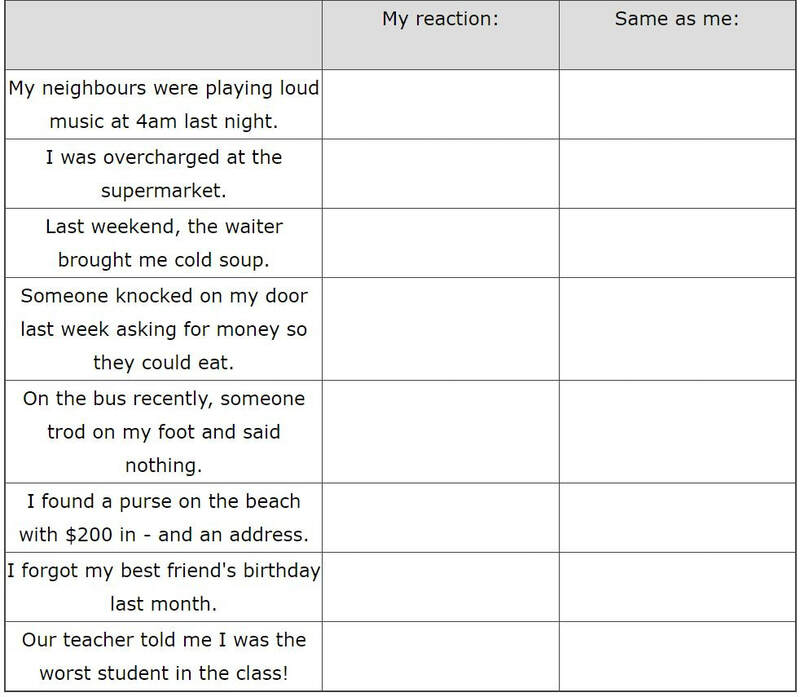 Get a test online to practise the listening skills of this level.